1) Hubble is currently in "safe mode", basically sleeping. The Science Instrument Command and Data Handling System has failed (arrowed in the picture at left). It worked for 18+ years, which is pretty good. The specific part that failed is the Science Data Formatter, which takes the observational data, formats it into packets, adds headers, then sends it down to Earth at a rate of 1Mb per second. Without it, Hubble can take data but cannot send it to us! It’s not known exactly what piece of the SDF failed, but the whole schmeer is basically on the fritz. There is hope, though. There’s a spare SICDHS on board Hubble; NASA built in redundancy. 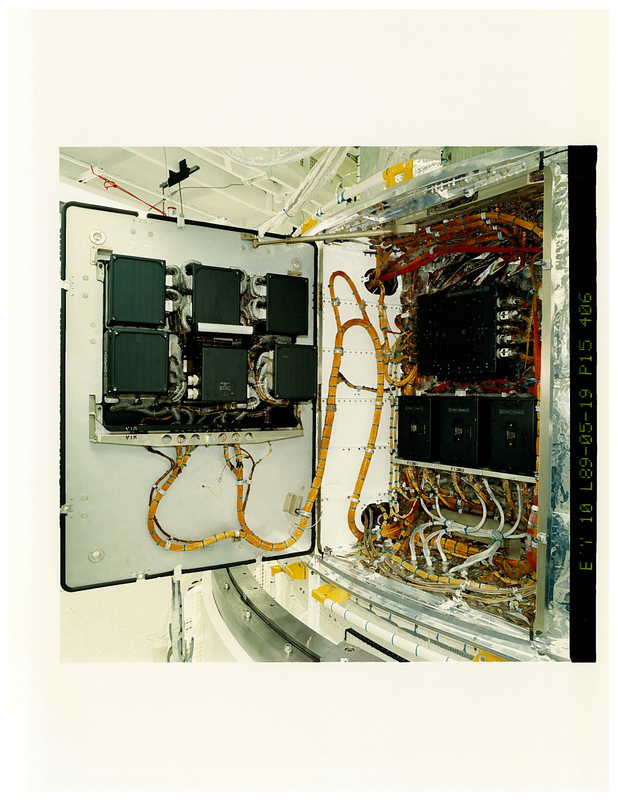 Called Side B (that’s a generic term; the redundant systems on any piece of hardware — even the cameras themselves — are called Side B), it has not been turned on since before Hubble was launched in 1990. NASA will try to switch it on, but it’s not like just hitting a button; a lot of work has to be done first. They’ll have to put the ‘scope in hardware safe mode, basically shutting it down to prevent any problems. They’ll also have to turn on the last remaining gyro to make sure it will stay pointed correctly. Not just the SICDHS but also the entire Data Management System has to be switched to Side B as well, which is a "major event". Then, we have to hope that the Side B electronics, which have been sitting in space for nearly two decades, will turn on without a hitch. All in all, this is quite an undertaking, and NASA understandably wants to take its time figuring this out. 2) NASA is also working up a plan to bring up a spare SICHDS and put it on board Hubble, which is very cool. I was concerned about what would happen if Side B fails; that’s a single point of failure now that Side A is down. Having a spare launched is a Good Idea. They’ll have to get the astronauts trained to install that, so the servicing mission has to be delayed. That’s a problem given that the spacewalk schedule is packed. But the changeout should only take a couple of hours; if they can do one of the camera repairs quickly enough, they can pack the new SICHDS into the existing schedule. They have to test the spare SICDHS first, and that takes time as well; it may be early January before it can be delivered to Kennedy for installation on the Shuttle. 3) Endeavour will launch (most likely on time) to go to the ISS in November. They’ll have to figure out when they can launch the delayed servicing mission, but it’ll be a while before they will know. It’ll be months from now for sure. Just so’s you know, it costs about $10-11 million/month to keep the Shuttle on the ground, so they hope to launch sooner rather than later. One number thrown out for the delay was three to four months, but they just don’t know for sure. Making things worse, Atlantis is already on the pad, so they’ll have to roll it back to the Vehicle Assembly Building if they delay the launch for months. So the upshot is that this is pretty bad, but possibly not a disaster. If Side B comes up, then Hubble will work and we’re fine until the next servicing mission, when they can install the new cameras, gyros, and other hardware — including the spare SICDHS. If Side B does not come up, well then, yeah, things are bad. Hubble will have to stay down until the new servicing mission can be launched, which means three months at least without a working observatory. However, once the servicing mission goes up, one way or another NASA currently thinks they’ll be able to get Hubble back up, shined up, and running smoothly. It will take some time, days at least, before we get more news. But I’ll add that things could have been much, much worse; had this happened after the servicing mission — and it only happened two weeks before the scheduled launch! — and Side B didn’t go up, that would be it. Hubble would be dead. So it’s actually rather good it happened now. It’s almost funny, but that’s the bright side to this.